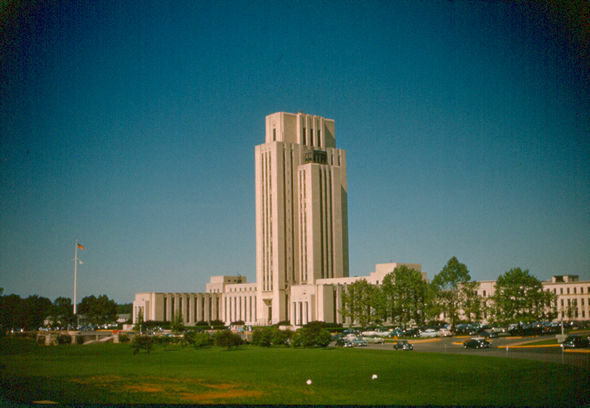 This is the National Naval Medical Center back in the fifties. The site was previously a farm and was chosen by President Roosevelt in 1938. The center opened officially in 1942. The road (Wisconsin Avenue) on which the site is located was previously designated as US Route 240 and was the main route from Washington to the Pennsylvania Turnpike and west. After Interstate 270 was built the road was redesignated as State Route 355. The route near Frederick MD was well known for its many "Barbara Fritchie Famous Candy" signs.